Personalized Black Onyx memorial pendant engraved with name and dates. Personalized with name & feather graphic. 10 Different sentiments to choose from! Quality solid maple wood photo album with satin finish. Holds up to 100 cherished 4" x 6" photos. 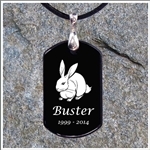 If a special friend or family has lost their furry or feathered companion, one of our memorial picture frames with bunny or feather designs, custom jewelry with rabbit or bird designs or urn name plate will make a wonderful gift of love and something they'll remember forever.